This compelling book analyzes the rise of civil society and legal contentiousness in contemporary China. Scott Wilson examines how Chinese AIDS carriers and pollution victims, relying on weak laws and judicial institutions, pursue justice and protection of their rights in Chinese courts and civil society. In exploring the “politics of justice” in China, the author contends that civil society and legal rights advance when their organizers have support from pockets of the Chinese Communist Party, resources from international groups, and the backing of protesters. Even lawsuits that fail in the courts can raise societal consciousness of social issues and can lead to revised state policies to address the substantive claims of disadvantaged citizens. Underlying the politics of justice is the regime’s attempt to balance commitments to legal development and its interest in regime stability. Wilson argues that the Chinese state has looked more favorably upon pollution victims’ civil-society organizations and lawsuits than those of AIDS carriers. 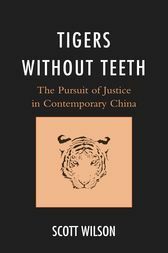 Going beyond the standard overviews of China’s legal system, Tigers without Teeth is unique in its close comparison of legal activism on two sensitive and politically relevant social issues. It provides important insights into the development of civil society, as well as highlighting limitations to the pursuit of justice as the system balances between the development of rule of law and regime stability. A thought-provoking treatment of the ‘politics of justice’ in China that focuses on legal activism by pollution victims and HIV/AIDS carriers. Wilson skillfully yokes together litigation, protest, and activities by civil society groups to give us a fresh perspective on regime legitimacy, legal change, political advocacy, rights consciousness, and the delivery of social justice in China. Scott Wilson is Alfred Walter Negley Professor of Politics, The University of the South.